As a yoga teacher, it’s very important to me to provide options for students. Doing so gives students the freedom to be themselves and make the practice their own. It can be very freeing when the teacher provides options, whether suggesting baby cobra or upward dog when moving through sun salutations, hands at heart center or reaching to the sky when balancing in tree pose, or offering a moment in class to flow in any way the body would like. Choices empower students to explore what works for them as well as to create the practice that they want. But what does all of this have to do with kale salad? In yoga class, we talk about bringing your practice off the mat and into your everyday life. Just as you do during yoga class, you can find moments to explore, be creative, and find freedom. I think the kitchen is a great place to start. A friend introduced me to this salad and, with time, I’ve made it my own. I’d grown tired of the typical salad combination of iceberg or romaine lettuce, carrots, tomatoes, and/or cucumber and found this salad to be really delicious. I now make it often and bring it to bbq’s or family gatherings. It’s always a hit, especially with people who say they don’t like salad. 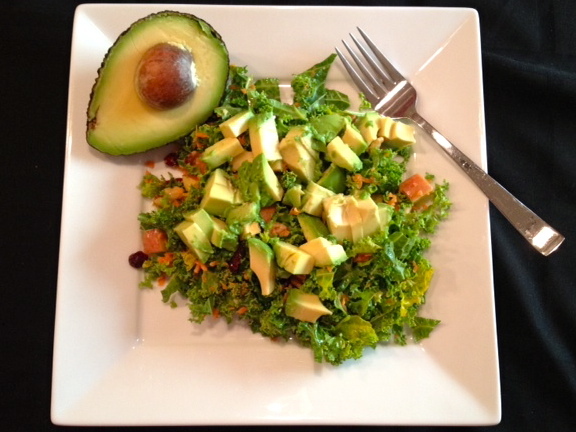 I invite you to give this kale salad a try and make it your own, too. I provide lots of options and leave out exact amounts so that you have room to figure out what works best for you. Remove the inner rib of each kale leaf before chopping into small pieces. Combine all salad ingredients in one large bowl. Use the combination of ingredients you think you’ll like best. You always have the option to go heavy on an ingredient you love and to lessen or eliminate an ingredient you don’t care for. Remember: This is your kale salad. Wisk dressing ingredients in a separate small container until you’ve achieved the desired taste. Drizzle over salad. Since kale is hardy, you can let the dressing sit on the salad for some time to allow the leaves to soften. I’d love to hear how this or a past recipe worked out for you! Drop me a line at Jessica.namit@gmail.com or through my website at jessicanamit.com.